To request a summary of the information that SXSW collects about you, or to request that data be deleted or changed, please email datarequest at sxsw.com. To update your email marketing preferences, please email sxsw at sxsw.com. 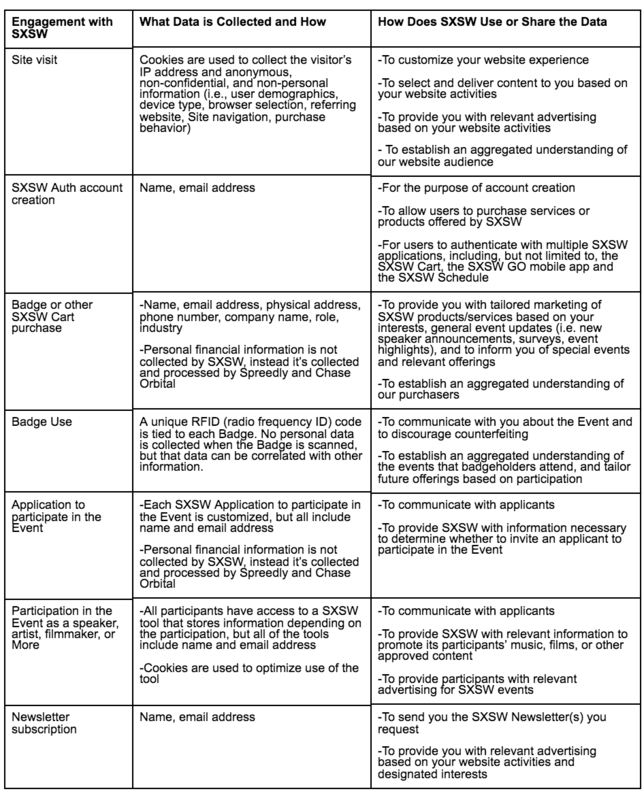 Below is an overview of the type of personal data SXSW commonly collects, and how we use that personal data. Deactivating Cookies. You can block collection of your information and Site activity by turning off cookies. You will find further information on how to turn off cookies in the support page of your respective browser. Deactivating cookies may hinder our ability to provide you with certain services or your ability to enjoy certain features of the Site. Web Beacons. We also may use web beacons to collect anonymous, non-personal information about your use of our Site. Web beacons are tiny graphic image files embedded in a web page or email that provide a presence on the web page or email and send back to its home server information from the users’ browser. The information collected by web beacons allow us to statistically monitor how many people are using our Site, or are opening our emails. How Use We Cookie and Web Beacon Information. The information collected by cookies and web beacons helps us dynamically generate content on the Site or in emails specifically designed for you, allows us to monitor Site traffic (i.e., where a user is geographically located, device type, browser selection, referring website, Site navigation, demographic information), and provide advertising tailored to you, as discussed in detail in the Marketing and Promotions section. We will not link non-personal cookie or web beacon information to any personal data collected, unless you share that personal data with SXSW through one of the SXSW forms (e.g., subscribing to a SXSW Newsletter). Location Services. You can opt-in to Location Services on the SXSW GO app, which will enable SXSW to communicate with you about the SXSW event based on your location using push notifications. If you opt-in to location services, SXSW will collect the geofence zones you enter. SXSW may use this information in the aggregate to understand attendee navigation of the Event. SXSW Recommends. You will have the option to favorite schedule information in order to log the events you are interested in attending. If you favorite items on the SXSW schedule, you will receive schedule, event, and registrant networking recommendations from SXSW based on those favorited items. You can also choose to make your profile in the SXSW GO application public or private. If you make your profile public, you will receive recommendations for other registrants in the directory based on the other registrants you’ve favorited, and your profile may be used in recommendations to other registrants. Public Forums. If you share personal data with others in a forum, such as via SXSW Social, that information will not be private. Please think carefully before disclosing any personal information in any public forum. SXSW works with third-party service providers to collect information about your Site activity using common tracking technologies, such as cookies, web beacons, and tags. These tools allow SXSW to customize your experience on the Site by analyzing Site traffic and providing you with content and advertising that is tailored to your interests. If you don’t wish to have your activity tracked, learn more about the Do Not Track tool. SXSW also uses linked advertisements and newsletters to deliver information to you that is interest-based or about the Event. Cookies & Web Beacons. We may use information from cookies and web beacons collected from your use of the Site to target your online activity, browser or apps, with certain advertisements, and/or to determine the popularity of certain content or advertisements. By using the Site, you agree to SXSW collecting and using your behavioral information for those purposes. Third-Party Tracking. SXSW works with advertisers that use tracking technology (i.e., Facebook Pixel, LinkedIn Insight Tag, etc.) to collect information about your Site activity and third-party website activity that allows us to customize the content and advertising that is delivered to you. We may also use third-party tracking technology to generate analytics reports used to improve our Site, track our success at reaching audiences, and optimize delivery of Site and ad content specifically targeted to your interests based on your use of our Site. We will not combine non-personally identifiable information collected through third-party advertiser tracking with your personal data. We will not attempt to disaggregate data that third-parties report in aggregate. Newsletters. You may opt-in to receive email subscriptions that contain content about the Event based on your preferences. SXSW may suggest certain newsletter subscriptions to you based on your Site activity. To opt-in or opt-out from SXSW Newsletters, see the section below: Managing Your Preferences. Badge Purchase Information. In order to access certain products and services available on the Site (e.g., a Badge), you must register with SXSW and provide personal information, including your name, email address, physical address, phone number. This information is necessary for SXSW to complete the purchase, provide the products and/or services to you, and communicate with you about your purchase. If you connect to the Site or sign up for promotions using your Facebook or other third party credentials, you authorize us to collect your authentication information, such as your username, access credentials, and other information that may be available through your Facebook or other third party account, such as your name, profile picture, country, hometown, email address, and/or date of birth. Badge Registration Terms. All Badge purchasers must agree to the Registration and Credentials Terms and Conditions (“RCTC”) available here, and the RFID Policy, which is available here and included in the RCTC. Please carefully review the RCTC and RFID Policy before proceeding with a purchase. SXSW scans Badges for RFID at the entrance of official SXSW events to discourage counterfeiting, communicate with you about the Event, and tailor future offerings based on attendance. For example, SXSW may email you asking for feedback based on a panel you attended. RFID does not contain any personal data, however, it contains a unique ID code that may be correlated with your personal data, such as your name, phone number, mailing address and email address. SXSW does not share RFID information with third-parties for their marketing purposes, and SXSW does not track RFID tags after SXSW has ended. For more about the RFID Policy, please visit www.sxsw.com/rfid, and direct questions regarding RFID to rfid at sxsw.com. You can also choose to scan your Badge to participate in lead retrieval, which is a program for SXSW official clients to collect information from and to communicate with SXSW badge-holders. If you elect to participate in lead retrieval and have your Badge scanned, you will share your name, email address, phone number, company, title, City, State, and Country with the company scanning your Badge. SXSW may also use this data for aggregate reporting. Applying to Participate in SXSW. If you choose to apply to participate in SXSW as a Speaker, Artist, Filmmaker, or any of the many other ways you can participate in SXSW, you will be asked to complete an application including your name and email address, along with other information necessary for SXSW to review your application, determine whether to select you to participate in the event, and communicate with you about your application. Communication with SXSW. If you email SXSW or communicate with SXSW via any chatbots, any information you share with SXSW may be stored on our email servers and elsewhere depending on your request. If you want to keep business information, resumes, ideas, concepts or inventions private or proprietary, do not send them in an email to SXSW. Storage. SXSW will store your personal data as necessary for the above-mentioned purposes or as required by applicable law. Generally. SXSW will only share your personal data with your consent or as necessary to answer your questions, provide the products and/or services you request or purchase from SXSW, or to comply with governmental, legal, or internal record-keeping requirements as reasonably required. Operations and Maintenance Vendors. SXSW’s operations and maintenance vendors may have access to your personal data to the extent reasonably necessary to provide specified products or services to SXSW. These vendors and suppliers provide us with technology, services, and/or content related to operation and maintenance of our Site, the SXSW systems, and the Event. Access to your personal data by these vendors is limited to the information necessary for it to perform its function for SXSW. Drawings, Contests, Giveaways, and Promotions. We may offer you the chance to participate in drawings, contests, giveaways, and promotions (“Special Promotions”) through our Site. By registering for a Special Promotion, you may agree to the use of your name in marketing associated with the Special Promotion, along with the announcement of winners. Aggregate Information. SXSW may provide third parties with non-personal information about you that does not allow you to be identified or contacted and that is combined with the non-personal information of other users. For example, we might inform third-parties regarding the aggregate number of users of our Site. Opting-In. You may opt-in or sign up for recurring informational / promotional emails from SXSW at www.sxsw.com/newsletters. If you have a complaint or problem you may email us at info at sxsw.com and the customer service department will forward your complaint to the appropriate internal SXSW department for a response or resolution. We try to answer every email in a timely manner but are not always able to do so. Our Retention of Personal Data. SXSW retains personal data for as long as necessary to provide the products and fulfill the transactions you have requested, or to comply with our legal obligations, resolve issues, or enforce our agreements. Actual retention periods vary depending on the data types and the goods or services you purchased. Collection of Data From Children. This Site is not intended for use by persons under thirteen (13) years of age and shall not be used without the consent from a parent and/or guardian. SXSW does not knowingly collect personal data from or about children under the age of thirteen (13). If a parent or guardian believes that a child under thirteen (13) years of age has shared personal data with SXSW without the parent or guardian’s consent, please contact us at info at sxsw.com. Security. SXSW has put in place appropriate safeguards to prevent unauthorized access to your personal data. Although we take such efforts to protect your personal data from loss, misuse, or alteration by third-parties, you should be aware that there is always some risk involved in transmitting information over the Internet. Residents of California have a right to request a detailed list of any third-party entities with which SXSW shares personal information for their own marketing purposes. You may opt-out of having your personal data shared with third-parties by sending your request including your full name, email address, and postal address to: SXSW, LLC, P.O. Box 685289, Austin, TX, 78768, USA ATTN: Privacy Officer or by emailing sxsw at sxsw.com. California residents using the Site are entitled to know that they may file grievances and complaints with the California Department of Consumer Affairs, 400 R Street, Suite 1080, Sacramento, CA 95814, by phone at 916-445-1254 or 800-952-5210, or by email to dca at dca.ca.gov.